Finally!! we are away! yay!!! 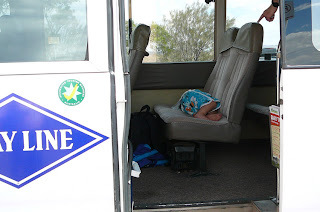 The boys and i caught The Ghan from Katherine to Alice, and Tim drove the van down. Booking online i was able to get Ghan tickets for under $300 all up (only had to pay for two of us) which was well and truely worth it so we could get to the centre fast cos with the kids it wold have taken a minimum of five, more likely six, days full on driving but we could do it in two days this way. 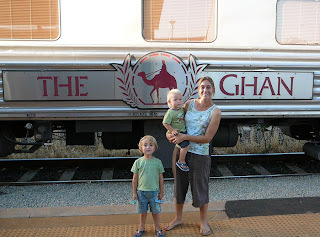 The Ghan was pretty decent. I think if you did not have two toddlers to chase it would be much nicer! And if you had no great need for sleep it would be perfect! LOL! I thought the seats fully reclined for us to sleep on- but not so much. We got on board around 5:30pm and arrived just after 9am the next day so it's mostly overnight. The boys played with their new matchbox cars and planes, and were happy to look out the window and chat to other passengers so both really enjoyed the trip. I would have liked more than two hours sleep. 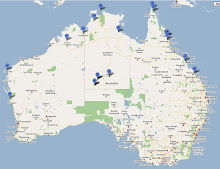 Alice Springs is really nice! We had heard that it was a bit crappy, but i have no idea what they were comparing it to. 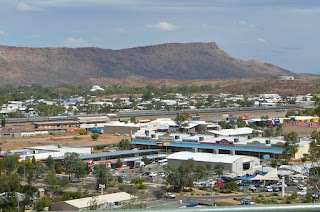 The people are lovely and friendly, the town looks nice, lots to see and do, the locals that gather in the parks and on the hills are all family groups and are happy playing and chatty... nothing at all like the undercurrent of aggression and anger we encountered at Tennant Creek and other places. Anyway, the boys and i checked into the Big 4 and then were picked up by our hop on/hop off tour bus. Had an enjoyable tour of the town, a look at Anzac Hill where we could see The Ghan still at the station. Darcy fell asleep on the bus! Then it was Jordy's choice for what he wanted to do. 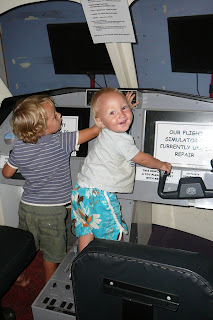 He chose the Flying Doctor Museum (big surprise) where they spent forever on the flight simulator console pretending to fly and pushing a heap of buttons. 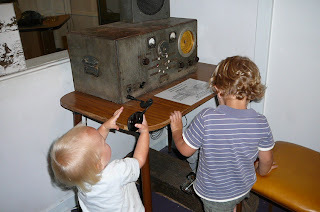 Then they had a go at the peddle radio. Had some lunch, went back to the flight simulator and then jumped back on the bus. 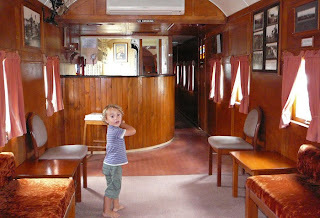 Next stop was the Old Ghan Train Museum. Another selection from Jordy. Out the front was a playground and a toy area with all-things-trains and i did not think we would get past that into the actual musuem. Eventually we did! 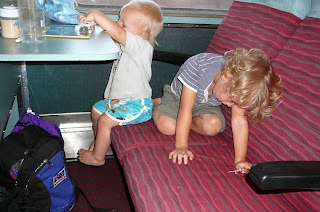 And the boys ran squealing through the old Ghan carriages and looked at all sorts of train-related bits that they found fascinating. Is it really a boy thing? I can't figure where it comes from. Then back to the van park. It was only mid-afternoon but we were all buggered after a busy morning on not much sleep. Tim surprised us by being there already. He had a good run and had driven late the night before. We spent the afternoon just playing in the park playground (really great playground here!). It got super cold overnight. We were not prepared for it and had to drag on lots of blankets from around the cabin. First really cold night we have had for absolutely months... maybe even the coldest since last winter. I am not really sure, but i know our bodies have forgotten how to deal with it. This morning Jordy was sitting at the table waiting for breakfast and i was trying to get him to put a jumper on. He said he did not need one and was not cold. A minute later, in a really sad voice, he told me he could not stop his chin from wobbling! I convinced him to put on a jumper! Today we did another lap on the hop on /hop off bus. Checked out the Araluen Cultural Precinct with the art gallery, museum, and Strewloh Research Centre. 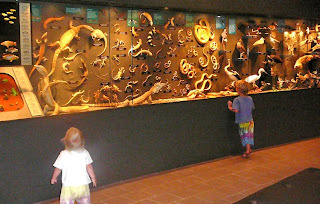 Kids had a ball in the musuem. They were rather noisy in their appreciation of the displays and we were asked to keep it down... oops! Then we had a look around the Todd Mall (lots of galleries and souvenier shops and cafes), then back to the van park playground and jumping pillow. Mum and Dad caught us up today. 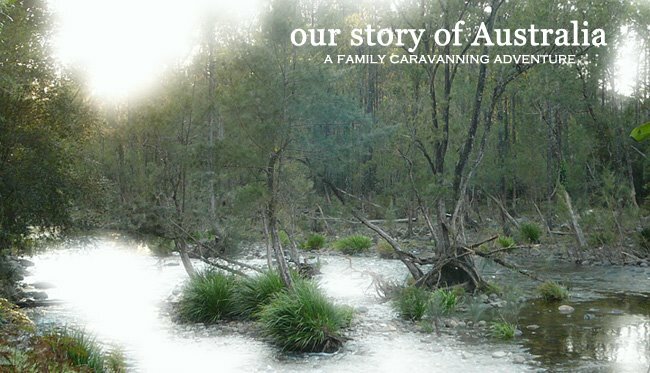 We'll head off to the West McDonald ranges tomorrow and they will check out more of the town and we'll all meet up again at Uluru in a few days time. I wasn't sure how the boys would go with the long train trip - good to see they coped pretty well (even if that meant you got no sleep). 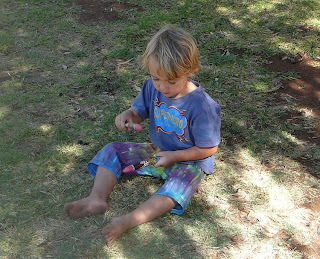 Jordy does love his museums and planes - can't wait to see what he will do when he is older. I can't believe how much Darcy has changed in the few weeks since I saw him! !